A new computer model suggests that the outer crusts of so-called neutron stars are the strongest known material in the universe. 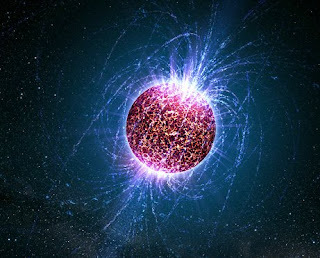 To determine the breaking point of a neutron star's crust, the team modeled magnetic field stresses and crust deformation for a small region of the star's surface. The results showed that the crust of a neutron star can withstand a breaking strain up to ten billion times the pressure it would take to snap steel. "It sounds dramatic, but it's true," said study team member Charles Horowitz of Indiana University. Neutron stars are the second densest objects in the universe after black holes. A teaspoonful of neutron star matter would weigh about a hundred million tons. Unlike normal stars, neutron stars have solid outer shells that hold a soup of superdense subatomic particles, astronomers believe. Even though a neutron star's crust is incredibly strong, it can crack due to stress from the star's powerful magnetic field, experts say. Astronomers think that crust cracks can create "magnetar flares," extremely energetic gamma-ray bursts from strongly magnetized neutron stars. The model also has implications for the height of neutron star "mountains," irregularities on the surfaces of the stars that are thought to help create gravitational waves. The waves are theoretical ripples in the fabric of space-time that race outward at light speed from massive spinning objects. The new calculations suggest the mountains are more like stellar goose bumps than giant peaks. For instance, the mountains can be a few kilometers wide but only about a centimeter (0.39 inch) high, Horowitz said.